Hayman Island in Australia has a new General Manager whose resume includes time at Cipriani in Venice. The private island also opens its eight new beach villas this month. Wolgan Valley Resort includes a 60-min massage for our Virtuoso clients and is one of the top Australian properties featured on the new site www.luxurylodgesofaustralia.com. I love this site, as it showcases the best luxury boutique properties in Oz. When you arrive at the Upper House in Hong Kong, check-in is by iPad and there's an iTouch in every room loaded with music, games & room service menu. Cafe Gray here just got a Michelin star.Look for sister Swire Hotels to open in Shanghai & Vietnam. Formerly a top concierge in Florence, Claudio Meli the GM of JK Place Firenze welcomes his guests without a formal check-in process (love this). Benefits of staying at this fashion-forward hotel include connections to the top designers and boutiques in town. Already on T&L's hot list, JK Place Firenze is expected to join sister Capri property on the Virtuoso preferred property list in 2011. JK Place Capri offers private access to the only sand beach in Capri. That, plus a 50 staff to 40 guest ratio, a fabulous GM, and NO charges for internet, breakfast or minibar put it top of my list (and of many celebs') of where to stay in Capri. One of my favorite Greek island boutique hotels, Canaves Oia, appears likely to join the Virtuoso network in 2011. This Small Luxury Hotel sits on the most beautiful area of the Caldera in Oia, Santorini and has a setting to die for. The hotel's owner and general manager also told me to keep my eye out this year for the unveiling of SeaSky, Santorini's newest ultra-luxe hotel. In Sydney, the Four Seasons Sydney JUST completed a major redo of its NYC loft-style Presidential Suite. And Park Hyatt Sydney closes for a complete redo April 1. Firm opening date for the completely redone Four Seasons London is now January 31. And, we're hearing June for Four Seasons Marakecch. Last December, restaurant/catering genius Barton G. spent $2.5 million on the Versace Mansion & transformed it into the Villa by Barton G. The 10-room property in the heart of South Beach, Miami offers opulent suites, beach views, rooftop dining & fabulous Versace furnishings. Sitting on 34 acres of olive trees just 25 minutes from Nice near St. Paul de Vence, Chateau St. Martin & Spa is currently adding a second restaurant and renovating its open-air gym and three-bedroom villa. The Michelin-starred chef hails from sister property LeBristol in Paris, there's a LaPrairie spa, and all suites feature seaviews and la Prairie amenities. Note to self: Perfect spot to enjoy the best of Cote d'Azur & Provence. Rocco Forte will open its first Middle East property in Abu Dhabi mid-2011. It will feature a 6th-floor, Mosque-view Sky Bar, 281 rooms and a yoga studio. Wimco, one of our favorite villa companies, now offers private homes for rent in Mexico, Hawaii and Nantucket. Their new concierge office in St. Barts can arrange for car rentals delivered to guests' villas and shared or private charter flights from San Juan (a nice alternative to St. Martin arrivals). Six Senses newest Thai island property Soneva Kiri is being billed as "jungle meets beach". The 36-villa resort sits on Thailand's 4th largest island and is just a one-hour flight from Bangkok. All villas have private pools, bay views, and the smallest is huge at 4,000 square feet. 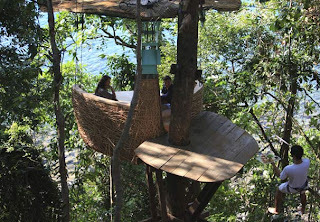 Cool features: Tree-top dining with meals served by waiters on zip line (pictured above); a "Chocolate Bar" open 11am-11pm; and direct flights to Angkor Wat, ideal for day trips. Opening next week is Six Senses newest resort, Con Dao in Vietnam (a 40-min flight from Ho Chi Min). Expect to see a "new generation" of Six Senses here according to execs, who tell us the two- to four-bedroom villas will be "a little sleeker" though still "rustic". Guests are given Vespas to drive around the island, and activities include trekking, diving, snorkeling, visiting local villages (2,000 Vietnamese live here) and enjoying the fab Bamboo spa. Sister property Six Senses Laamu opens April 2 in the southern Maldives (45 min from Male). Billed as bit "younger and larger", the resort will open with 100 villas, plenty of family-friendly sports & activities, a gastrodome/wine cellar and bi-level beach and overwater bungalows. Look for Six Senses to open three Morocco properties in 2012, Bahia Beach, Brazil in 2013 and their first "non-remote" location in the Turks & Caicosin 2013. Big news: Hotel Bel-Air will finally reopen July 15 after its $150 million renovation. Under the eye of GM Tim Lee, the "new" Hotel Bel-Air will offer 103 rooms and suites (including 12 completely new Canyon View accommodations), each with Bang & Olfsen TVs, contemporary design, heated limestone floors, a chic lobby with a fireplace, a "to be named" celebrity chef, larger bar areas, and a La Prairie Spa & first-class fitness center. Also making news: Two new bungalows at sister property Beverly Hills Hotel will open in February on the site of the hotel's former tennis courts. Look for the new units to offer 5,500 sq feet of indoor/outdoor space and a beautiful, contemporary decor. Al Maha, an Arabian-style desert resort 45 minutes from Dubai Airport, is now part of Starwood's Luxury Collection as of Nov 1. The 42 "tented suites" each feature a private terrace/pool and new Starwood beds, and rates include all meals and choice of two activities/day (options range from horseback riding to camel trekking). Owned by the Ferragamo family, Il Borro sits in the middle of a vineyard and offers 25 one- to four-bedroom apartments and three villas just an hour ddrive or 20-minute train ride from Florence (and 15 minutes from the Prada outlet). The newly renovated apartments (complete with separate kitchen/living room) start at just 300Euros/night, villas from 1000e/night. The stunning 10-bedroom main villa rents for 7000Euros/night. Activities include wine tasting, hot air balloons, biking, tennis, a spa/gym, indoor/outdoor pool. PERFECT for families and groups of friends wanting a true Tuscan experience. Opened this past June, Royal Mansour brings a new level of luxury to Marakecch. Featuring 53 bi-level Riads, the smallest of which is 1,600 sq feet (the largest being 22,000 sq feet), the property took nearly four years to build on eight acres of city center land. Riads each feature private plunge pools on a sun deck, and a very traditional Moroccan decor. Other highlights of the new hotel include an indoor and an outdoor pool, a gorgeous spa, kids/teen centers, three restaurants (two of which are labeled "gastronomic"), and stunning private dining rooms. Rumor has it Royal Air Maroc may add flights next year from Los Angeles, Chicago and Miami. In Barcelona, the fabled Ritz has been reincarnated as El Palace after a $30 million euro refurb. Walking distance to Las Ramblas, this Leading Hotel of the World has been updated top to bottom. Sister property Hotel Rey Juan Carlos offers a huge spa, gorgeous gardens and is ideal for families (second room available at 50% off). The new Mandarin Oriental Barcelona, located in a former bank building, sits amongst 7,000 square feet of gardens and offers a rooftop terrace, a spa with indoor pool, 100% of its rooms with outside views, and a stunning penthouse. Want to travel with like-minded women? Ask us about dedicated Tuscan wine, shopping, golf & other trips offered by our new friends at Macana. They've got great golf trips for the guys, too. Great group bike/wine trips for couples AND singles also offered in Europe and Napa Valley by Duvine Adventures. We love their motto: Eat, Drink, Bike, Sleep. Love the round-up! We'll be making our debut at ILTM in December and wanted to say hello here... we are IAVRA, a b2b platform for travel professionals in the villa rental industry.